The Dow Jones Industrial Average /ˌdaʊ ˈdʒoʊnz/, also called DJIA, the Industrial Average, the Dow Jones, the Dow Jones Industrial, ^DJI, the Dow 30 or simply the Dow, is a stock market index, and one of several indices created by Wall Street Journal editor and Dow Jones & Company co-founder Charles Dow. The industrial average was first calculated on May 26, 1896. Currently owned by S&P Dow Jones Indices, which is majority owned by S&P Global, it is the most notable of the Dow Averages, of which the first was first published on February 16, 1885. The averages are named after Dow and one of his business associates, statistician Edward Jones. It is an index that shows how 30 large publicly owned companies based in the United States have traded during a standard trading session in the stock market. It is the second-oldest U.S. market index after the Dow Jones Transportation Average, which was also created by Dow. The Industrial portion of the name is largely historical, as many of the modern 30 components have little or nothing to do with traditional heavy industry. The average is price-weighted, and to compensate for the effects of stock splits and other adjustments, it is currently a scaled average. The value of the Dow is not the actual average of the prices of its component stocks, but rather the sum of the component prices divided by a divisor, which changes whenever one of the component stocks has a stock split or stock dividend, so as to generate a consistent value for the index. Since the divisor is currently less than one, the value of the index is larger than the sum of the component prices. Although the Dow is compiled to gauge the performance of the industrial sector within the American economy, the index's performance continues to be influenced by not only corporate and economic reports, but also by domestic and foreign political events such as war and terrorism, as well as by natural disasters that could potentially lead to economic harm. 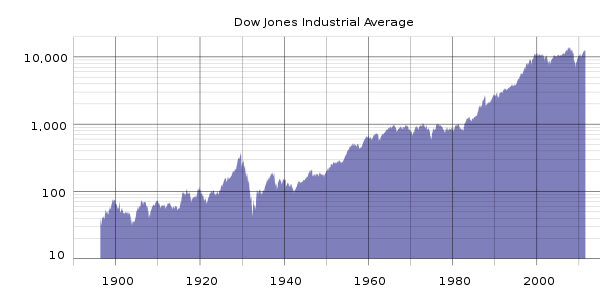 Historical logarithmic graph of the DJIA from 1896 to July 2011. The Dow Jones Industrial Average /ˌdaʊ ˈdʒoʊnz/, also called DJIA, the Industrial Average, the Dow Jones, the Dow Jones Industrial, ^DJI, the Dow 30 or simply the Dow, is a stock market index, and one of several indices created by Wall Street Journal editor and Dow Jones & Company co-founder Charles Dow. The industrial average was first calculated on May 26, 1896. Currently owned by S&P Dow Jones Indices, which is majority owned by S&P Global, it is the most notable of the Dow Averages, of which the first (non-industrial) was first published on February 16, 1885. The averages are named after Dow and one of his business associates, statistician Edward Jones. It is an index that shows how 30 large publicly owned companies based in the United States have traded during a standard trading session in the stock market. It is the second-oldest U.S. market index after the Dow Jones Transportation Average, which was also created by Dow. The Industrial portion of the name is largely historical, as many of the modern 30 components have little or nothing to do with traditional heavy industry. The average is price-weighted, and to compensate for the effects of stock splits and other adjustments, it is currently a scaled average. The value of the Dow is not the actual average of the prices of its component stocks, but rather the sum of the component prices divided by a divisor, which changes whenever one of the component stocks has a stock split or stock dividend, so as to generate a consistent value for the index. Since the divisor is currently less than one, the value of the index is larger than the sum of the component prices. Although the Dow is compiled to gauge the performance of the industrial sector within the American economy, the index's performance continues to be influenced by not only corporate and economic reports, but also by domestic and foreign political events such as war and terrorism, as well as by natural disasters that could potentially lead to economic harm. Don't be fooled by the Dow Jones Industrial Average.